Doris was born in USA in 1925. She fell down in childhood injuring her knee badly. After a lot of investigations doctors declared that her right leg will never be straight. Doctors advised that her right lower limb should be amputated. Thankfully her mother did not agree. After months of regular massage she could walk with some help. It was accepted that she would remain handicapped on wheel chair throughout her life. At the age of nine Doris suffered from very serious disease of the stomach. Doctors advised that she should be sent to Florida. It took one year for Doris to recover from this. Doris was very found of playing. Sometimes she used to play with her brother. With time her leg gained some strength and started becoming straight and gradually she got rid of her wheel chair. She started playing tennis regularly and practiced very hard . She left no stone unturned and reached the courts of Wimbledon. 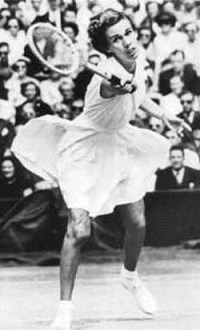 Doris played in Wimbledon final in 1947 against Margret Osboru and 1948 against Luis Bro. She tried her level best but could not succeed. In 1951 she played Wimbledon final against Shirley with a lot o self confidence and expertise. At the age of 26 Doris Won the final. After sometime Doris played in doubles final. Her partner was Shirley Fry. Their competitor was Luis Bro who was Wimbledon Singles champion for last three years in 1948, 49 and 50. Luis Bro’s partner was Margret Dupot. This pair had been winning the Wimbledon doubles championship right from 1948. Everybody was sure that nobody could defeat the duo. However, Doris and Shirley Won. After this Doris again played mixed doubles final. Her partner was Australia’s Frank Sandman. Competition was with Marwin Rose and Mrs. Nancy Volta. Finally Doris and Frank Sandman won the mixed double final. It was the happiest day for Doris. She had won three finals of Wimbledon in one day. She had proved that nothing is impossible if there is the will to win.